Since 1996, four states have implemented child welfare waiver demonstration projects focusing on the needs of families with substance abuse problems. These waiver demonstration projects allow states to spend federal foster care funds more flexibly in order to improve services and outcomes for children and families. Three states - Delaware, Maryland, and New Hampshire - focused on early identification of parents with substance use disorders and referral to existing treatment resources, seeking to prevent removal of children from the home. One state, Illinois, has used intensive case management and supportive services to support the recovery of caregivers whose children have already been removed from the home and placed in foster care. An independent evaluator evaluated each of the state projects. 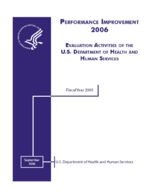 This report reviews the process and outcome findings from each of those evaluations and presents crosscutting lessons learned. Among the findings is that some states were successful in improving the engagement and retention of parents in substance abuse treatment and in decreasing lengths of stay in foster care for children removed from home. However, none of the state demonstrations has yet been successful either in reducing the rates of removal or in increasing overall permanency rates for children in foster care. Other lessons learned include the need to strengthen the skills of frontline child welfare workers to identify and assess substance abuse, and the need to have strong managerial support and consistent communication in order to foster successful collaboration between child welfare and substance abuse service providers.